When I was a teenager my father would limp around the house because of pain in his foot. This tough man was brought to tears and he didn’t know what was causing the pain. When he was diagnosed with gout, it was a relief, but brought on a new set of worries — how was he going to deal with this pain, off and on, for the rest of his life? His doctor prescribed him Indocin and Celebrex. Over the years his medications have been adjusted, but one thing has remained constant — he has required a medication to prevent a flare-up and a variety of other medications when it exacerbates. You may or may not require medication to deal with gout. 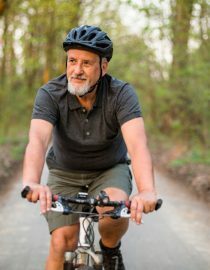 The advice below isn’t meant to take the place of your medications if you need them, but rather to supplement your everyday routine — and hopefully better manage the pain associated with your gout. Cherry juice for gout may be able to ease your pain: according to research from Michigan State University, consuming 20 cherries inhibits enzymes called cyclooxygenase-1 and -2. These enzymes are targets for anti-inflammatory drugs. Further research on a study group of 600 people with gout showed that consuming half a cup of cherries per day resulted in a 35 percent reduced risk of further gout flare-ups. For those ingesting more than half a cup per day, they had a 50 percent reduced risk of flare-ups. Eat the fruit or drink tart cherry juice concentrate. Cherry juice concentrate can contain as much as 50 to 60 cherries. Find one that is low in sugar, because sugar-sweetened beverages are thought to exacerbate gout. As you probably know by now, gout flares up when you have much higher than normal uric acid levels in your blood. This causes build-up in the joints, causing uric acid crystals to form. The uric acid crystals can cause excruciating pain. There are foods that are high in purine that are known to increase uric acid levels. Avoiding them can be beneficial. Certain meats are known to be high in purine; examples include organ meats, anchovies and sardines. There are also vegetables that contain high levels of purine, such as mushrooms, cauliflower and spinach. There is evidence that shows that avoiding plant-based foods high in purine may not be beneficial in reducing gout exacerbations — that being said, it does not hurt to cut these foods out as a trial if you are having a hard time. Adequate hydration can help flush excess uric acid from the body, so be sure to consume the recommended eight eight-ounce glasses of water per day. In addition, consuming alcohol can cause dehydration and irritate the urinary tract, so it may be best to cut back on alcohol intake. Caffeine can also be dehydrating, so eliminating or reducing caffeine intake is beneficial. Bromelain is a digestive enzyme that may be beneficial to people with gout. It can be found in pineapples, but can also be consumed in supplement form. Although further research needs to be done, it is possible that bromelain also has anti-cancer properties. Although exercise may be impossible during a flare-up, regular exercise is known to reduce uric acid levels. Getting in the habit of a regular exercise routine — and sticking to it — will be beneficial. During a flare-up, it is fine to relax the exercise routine. In fact, resting the joint during a flare-up is recommended. Apply ice and elevate, but make sure to get moving once you’re feeling better again! Whether you incorporate one or all of these tips into your daily routine, you may find you have fewer gout exacerbations and less pain when they do occur.